This is my choice for the 20th century classic category of the 2018 Back to the Classics Challenge. Holly is THE character around which the book revolves. Others love or hate her, but nobody is indifferent. She's the sort of person who will impose on somebody, then get prickly when he shows a subsequent interest in her background. Others may resent that, but our smitten young narrator simply takes it as a challenge. To me,Truman Capote's writing style seems more noteworthy than the story itself. His sparing prose has plenty of clever imagery, and a skillful way of making us sense things that aren't stated outright. For example, Holly is all about colour and movement. We deduce this from the way she dresses, her apartment's 'fly-by-night' look, and simply what she's written on her card, 'Holiday Golightly, travelling.' It all gives the impression that she's not static, but fluid verging on restless. And it's reinforced by a number of casual references all through, such as her avoidance of the zoo because she hates to see creatures caged. Capote pulls this off with a minimum of words, because the whole story is over in just 100 pages. Some of the minor characters are summed up in one or two revealing sentences, or even just a phrase. Rusty Trawler, her paunchy, wealthy middle-aged admirer, is a 'preserved infant.' The Brazilian Jose seems as out of place in their company as 'a violin in a jazz band.' And Mag Wildwood is a 'triumph over ugliness' since she accentuates her supposed defects rather than hiding them. It's easy to admire the way Capote saves space on descriptions, yet still makes his point. The title may be a bit misleading. I think there's something alluring about the mention of food on a cover. Maybe it gives the impression there'll be some homely warmth. Yet nobody in the novel has a meal at Tiffany's Department Store. Holly simply mentions it in passing as one of her aspirations. But even that turns out to be one of Capote's quick, subtle hints about the flip sides of her character, especially when snippets of her background are revealed. Holly is a girl who has the drive to leave an undesirable situation in search of something better, and the simple opulence of a department store during the war, with luxuries she can't afford, is enough to be her guiding star. I think we're meant to think that she has plenty of drive and gumption, but also naive idealism. It's one of those stories where the movie possibly surpasses the fame of the book, because the lead role is well cast. I've never even seen it, but it's hard not to picture Audrey Hepburn's pixie face and little black dress as I read, just through taking on the hype over the years. It sounds like Hepburn must have nailed the dual sides of Holly's character; coming across both determined and delicate just by being herself. Holly Golightly could be a hardened criminal, yet she might simply be an innocent girl, dragged into something over her head. 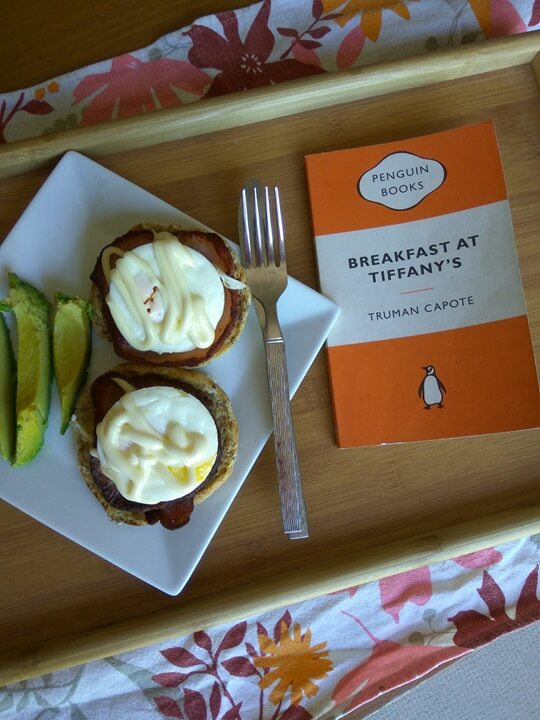 I'm sure Hepburn's is the name that springs instantly to most people's minds when someone says, 'Breakfast at Tiffany's' even more than the author's. I put it to the test, and my family had never heard of Truman Capote. Overall, I wasn't crazy about the plot. My favourite stories are usually longer, not so up-in-the-air, and not focused on just one character. 'Fred' reveals nothing about himself at all. Although he keeps repeating that it's not really about him, it might have been nice to at least know his name. As for Holly, well meh, I didn't get fond enough of the mystery girl to care much what happened to her when she made her secret disappearance. She's always condescending to the narrator, which grated on me. I wonder if I'm in the minority when I say I found the book pretty forgettable on the whole. The shortness is all that saved it from two stars, since it was too short to put aside. Sure, Capote's clever writing was good, but since he didn't intrigue me with his characters, then so what? If you want to give it a try, at least it'll be over quickly if you don't like it. I think the best character is the orange cat. I have always been interested in this one, especially after reading Capote's well-written, chilling and horrifying In Cold Blood. Good to know it is a short read, if I don't like it. I've not seen the film, but I did see Hepburn in War & Peace, and she is superb; so I am not surprised that the film exceeds the book. Anyway, it may be fun to read the book just as an excuse to watch the iconic film. Thanks Ruth, I haven't seen that particular Hepburn movie either, although I always remember the Seinfeld episode where George gate crashes some strangers to watch it 😏 Yes, the book is over in 100 pages. You can almost read it in just one or two sittings, which we definitely can't say for all classics! I've never read Breakfast at Tiffany's, and I've sworn I never will - simply because the film is my favourite of all time, and I'm terrified that the book will "ruin" it somehow! I have just finished reading (and reviewing) Capote's In Cold Blood, and he was a truly masterful storyteller. From your review, it sounds like perhaps that one might be more up your alley? It's certainly more plot-driven (well, real-life driven) than Breakfast at Tiffany's, and Capote's storytelling really shines through. Thank you so much for sharing your thoughts, a very interesting read! Hi Sheree, that sounds like a wise decision of yours. If the movie is your all time favourite, then why read the book? I am interested to get hold of In Cold Blood down the track. With Capote's great storytelling style, I'm sure he could do great things with a plot-driven page turner. Thanks for the heads up. Hi Paula...I just finished Breakfast at Tiffany's - also for the Back to the Classics: 20th Century category. I actually wished it was longer. Holly is one of those rare characters for me that although there is much in her character I do not like - somehow she is still likable (ala Scarlett or Becky Sharp). I also have not seen the film, and as I understand it, it isn't very faithful to the book...but yes...the divine Audrey Hepburn owns the role. Hi Joseph, yeah, she puts me in mind of those other two female characters you mention too, and you do have to admire all three. I still haven't seen the movie, but can imagine that it must add a fair bit, to fill out the shortness of the book. Maybe I could have got into it a bit more, had it been a bit longer.